It is always good to watch how the Lord orchestrates things. 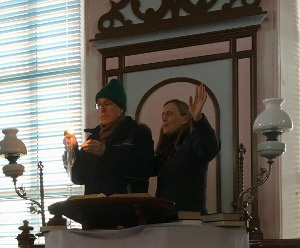 Just two days after last week's update when I talked about God's light breaking in, this spontaneous event took place in the chapel. I got a message Friday morning from our friend Helen Burgess from London who was house-sitting for some friends here in St Dogmaels. She had a friend from New Zealand visiting her for few days and wondered if we could meet and have some time to share and pray together before she left in the afternoon. Of course, we said "yes", and they were knocking at our door not long afterward. Helen's friend Sharon Thorburn has been on a fascinating journey with the Lord. Her assignment is to carry this simple but ornate "torch" to many nations and light it in places where God directs her as a prophetic act—a declaration that His light be released to shine through his family, the church. 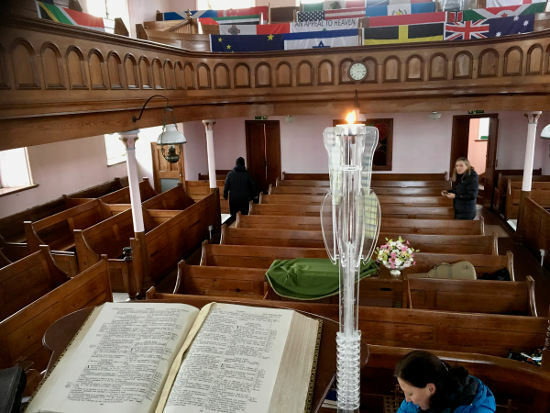 As you might well imagine she was surprised and blessed to find the flags of so many nations in a chapel tucked away in the farmland of West Wales. And I was equally surprised when she asked me to light it. As I prayed before actually striking the match I found myself overwhelmed by a sense of profound and tearful joy and release. It was as if this very act was clearly marking a turning point and a culmination nearly 19 years of intercession for Wales. This tiny candle in the brightness of the chapel in full daylight seemed insignificant, but in this context it was brilliant! 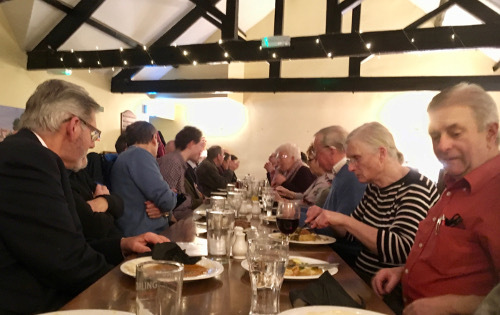 So yet once again we found ourselves astounded at how the Lord is moving people to and fro among the nations, and connecting people from such diverse places and backgrounds. In many cases those connections may be just a one-time interchange, but they are fulfilling His plans and purposes as Paul says in Ephesians 4:16, "from whom [Christ] the whole body, joined and knit together by what every joint supplies, according to the effective working by which every part does its share, causes growth of the body for the edifying of itself in love." 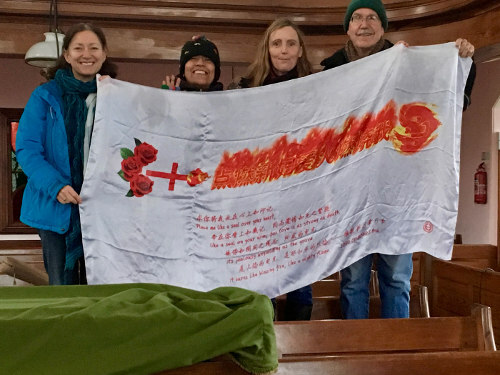 Another aspect of this "coincidental" meeting was that Sharon has been carrying this banner from Mongolia with her into the many nations she has visited. During the past several years Gladys has become interested in and praying for Mongolia. And now the Lord had brought this beautiful banner from the Christians in Mongolia right into our door! It was powerful for us to pray for them, and also to pray underneath it as a gesture of togetherness with them and others where this has been. It bears the verse from the Song of Songs 8:6, "Set me as a seal upon your heart, as a seal upon your arm; for love is as strong as death, jealousy as cruel as the grave; its flames are flames of fire, a most vehement flame." This is a pretty harsh sounding scripture, but not as harsh as the price Jesus paid for our salvation on the cross. And as the times we live in grow darker and unfriendlier to the Gospel, it becomes more important that we surrender more of our lives to His purposes for the benefit of others around us. It is a matter of life and death. We have seen more wind and rain since coming home than we have of the sun, and especially over the past weekend, there were very heavy rains. But happily it is not getting dark until about five now, and that means we are headed in the right direction. Speaking of darkness, I was reading the other morning about Jesus and the blind men in Matthew 20:30. "And behold, two blind men sitting by the road, when they heard that Jesus was passing by, cried out, saying, 'Have mercy on us, O Lord, Son of David!'" They too were headed in the right direction. They cried out! These men had obviously heard about Jesus and his power to heal, so when they learned that he was so close to them, they began to holler. That really struck me, and I began to realize how so many people in the world around us have a hunger for something more in their lives, some deeper significance to their existence. They may know something about the concept of God, or have even heard the Gospel, but don't believe, and so don't cry out. Then in the next verse 31 it says, "Then the multitude warned them that they should be quiet..." And so it is in today's world–the idea of believing in God is frowned upon in our "enlightened" age. How many people who might like to "cry out" are held back by peer pressure and shame. I found myself deeply moved in prayer, asking the Lord to enable people to "cry out" to Him in spite of resistance from within and without. 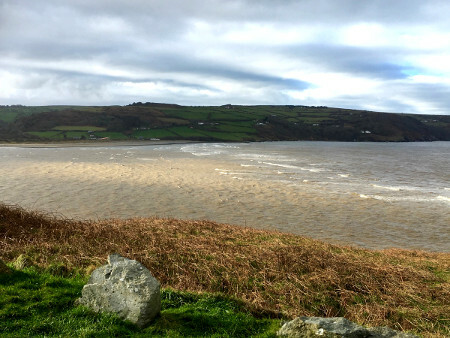 Just as the sun broke through the clouds to light up the muddy waters of the Teifi River as they flow into the sea, God's Sonshine can light up the darkened lives of the lost. Just as we now embrace the hope of the ending of winter, there is a far greater hope in Christ. And just as the blind men had heard of Jesus' fame, with our prayers we should be crying out for a greater manifestation of the "light of life". The scripture says in Isaiah 9:, "The people who walked in darkness have seen a great light; Those who dwelt in the land of the shadow of death, upon them a light has shined." Jesus said in Matthew 5:14, "You are the light of the world. A city that is set on a hill cannot be hidden." And so another huge goal for our prayers is that we, both as Christ's church and as individuals, be willing to ask the Lord to make adjustments in our lives that allow His light to shine freely through us. In short, we are called to discipleship. And it is our challenge to find out what that means for each one of us on a day-to-day basis. Monday night Glady and I attended the annual Teifi Pastors dinner. We are a group of folks from different churches in the area that take turns on Saturday nights to go out on the streets of Cardigan to let our light shine into some dark places. It was a joy to hear testimonies of things God has done over the last year. This practical outreach has been going on seven and a half years now and has been a blessing to many people. This is just one small way that we can reach out with God's love, but there are many, many more. In fact, there are as many ways of reaching out to those around us as there are of us, individual believers. We each have gifts and abilities that God has given us, and relationships in which to exercise them. He wants to show His love for every person in this broken world. And His plan is to do it through each one of us every day of our lives. We don't have to go out and take on huge tasks or missions. We just need to ask the Lord to guide us in small ways to show His love to others. It helps to remember that this is His idea, and not ours. And He is the one that empowers us to do them. Small "acts of random kindness" are not very hard. And little by little they add up to make a difference around us. 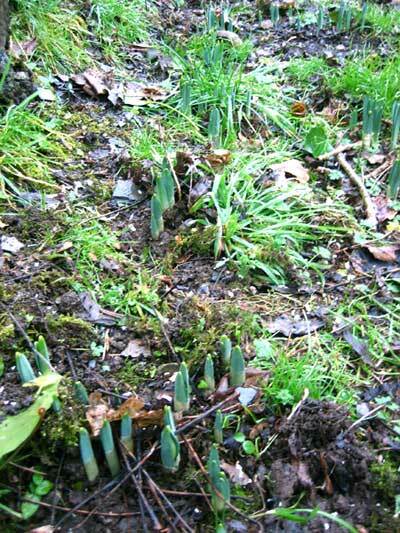 Just like one single little bulb poking its first leaves up through the soil may not seem significant, but time and numbers will make for a colorful spring. Ephesians 2:10 is a great portion of God's word to keep foremost in our hearts and minds. "For we are His workmanship, created in Christ Jesus for good works, which God prepared beforehand that we should walk in them." Our daily prayer should include asking for His guidance to know what each day's good works are, and the strength to carry them out with gladness and simplicity of heart. 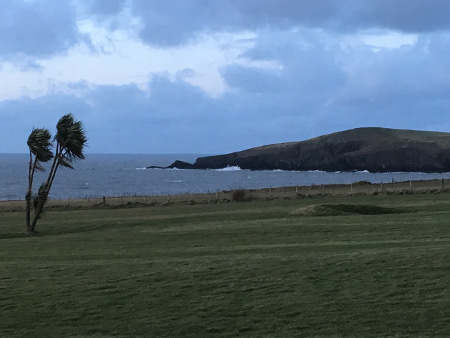 Home again – back from winter to Wales! We've been home for a week today, and the fact that we made a quick trip to the US seems like a dream. As we took off from New York's JFK Airport I found myself overwhelmed by emotions, almost as if we were leaving to establish our lives here for the first time. As we left country and family behind, for several minutes it seemed so hard all over again. And yet this adventure of faith the Lord has given us here for the coming revival in Wales has been nothing short of amazing. And we know that the best is yet to come! Shortly afterward I ran across these words of 20th-century missionary Jim Elliot who famously wrote in his diary, "He is no fool who gives what he cannot keep to gain that which he cannot lose." Thoughts like these help us keep our focus on the big picture. And as Paul says in Philippians 3:7-8, "But what things were gain to me, these I have counted loss for Christ. Yet indeed I also count all things loss for the excellence of the knowledge of Christ Jesus my Lord, for whom I have suffered the loss of all things, and count them as rubbish, that I may gain Christ." And he also says in 2 Corinthians 4:17, "For our light affliction, which is but for a moment, is working for us a far more exceeding and eternal weight of glory." 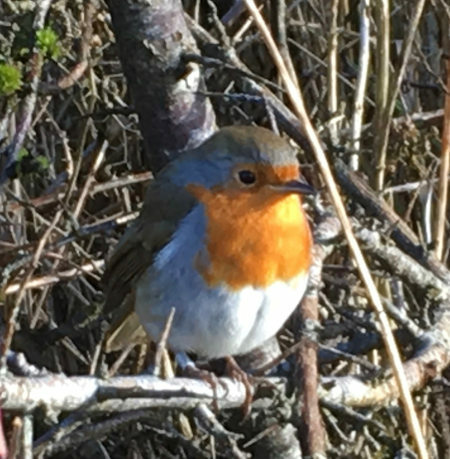 This little robin let me get very close yesterday to take its picture as if he too understands the principle of risk vs. reward. He was perhaps hoping for a handout, but instead, all he got was a smile and a digital trip around the world. But our "risk", as some might see it, is not really a risk at all because God's promises are rock solid. 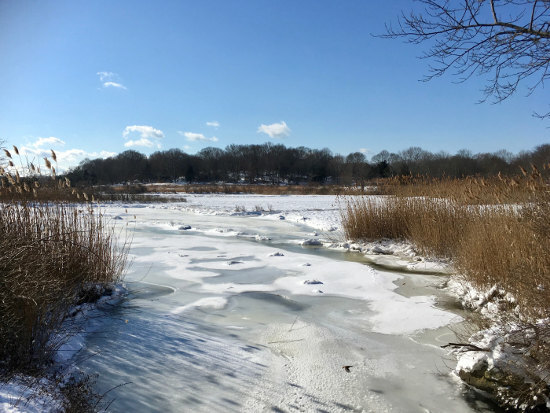 My walk just over a week ago by the tidal marsh off of the Long Island Sound was about 30ºF (17ºC) colder than our stroll through the Teifi Marsh yesterday. It is definitely still winter here, but nothing like the cold there. Gladys was happy to go walking here yesterday, but the hard winter in New York and Connecticut was a different story! As we look forward to this new year, we know the Lord is the one who makes the plans, and we are always happy and blessed to follow His lead. We surely will continue to receive visitors from the UK and abroad that also long to see revival where they live. 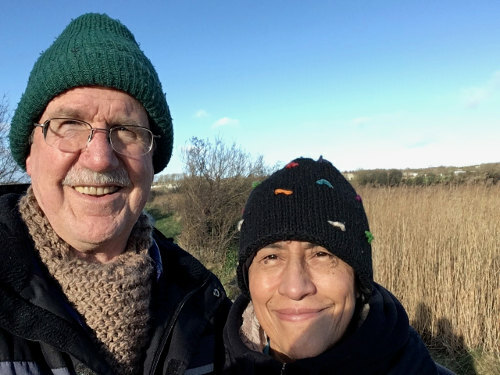 People who have learned about God's interventions in Wales over the last several centuries are always blessed and inspired to actually visit the places where they happened. And directing or taking them to these old spiritual wells is one of the things we particularly enjoy. Apart from this, we only know that we can expect more good things. We are getting closer and closer to the goal for which the Lord brought us here. And we look expectantly ahead as Paul's words express with such wonderful encouragement in Ephesians 3:20-21, "Now to him who is able to do immeasurably more than all we ask or imagine, according to his power that is at work within us, to him be glory in the church and in Christ Jesus throughout all generations, for ever and ever! Amen." A "Heart and Soul" Happy New Year for You! This portion from 2 Chronicles 34:31-32 provides a great focus for starting off this new Year, 2018! "The king went up to the house of the Lord and all the men of Judah, the inhabitants of Jerusalem, the priests, the Levites and all the people, from the greatest to the least; and he read in their hearing all the words of the book of the covenant which was found in the house of the Lord. Then the king stood in his place and made a covenant before the Lord to walk after the Lord, and to keep His commandments and His testimonies and His statutes with all his heart and with all his soul, to perform the words of the covenant written in this book." It seems to me that this emphasis of a "heart and soul" commitment to really go after the Lord could not be a better foundation for a new year. If this were paramount in our own lives and the life of the church, I'm convinced we would see a much greater impact in the world round us. Gladys and I are currently visiting my sister and her husband near Mystic, Connecticut. 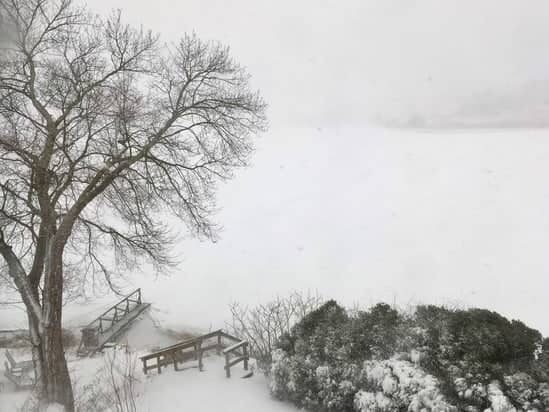 There is a raging blizzard outside, and the world is white and beautiful, and beautifully cold as well! We flew from London on Christmas Day to New York City, and have been staying with our daughter Grace in Brooklyn as we did last year. Our youngest son and his fiancé came home from California and we have been really enjoying lots a family time. This has always been a special time of year for us as a family because we celebrate two birthdays. Our son Richard turned 32 on the 27th of December. 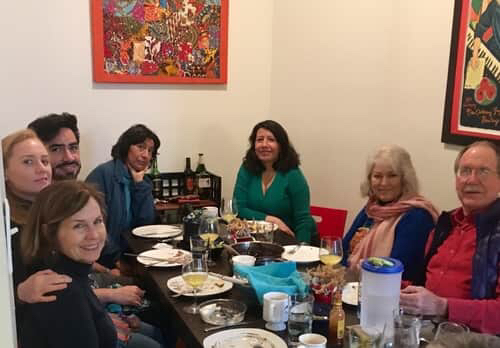 We were joined by his future in-laws for a Guatemalan brunch, complete with black beans, tortillas and queso fresco (fresh cheese). And an added special treat was a visit from our dear old friend Lil Hamman whom we've known for over forty years, since our days in Guatemala. Then on Sunday, in what seemed more like science fiction than reality, I turned 70. They say this a a milestone in one's life, but this occasion was far more than I could have imagined. 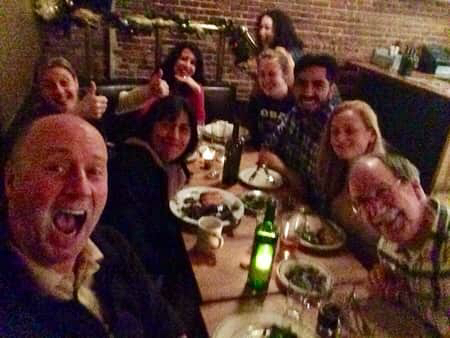 Besides a great time together with our kids and a nephew and family, Gladys gave me a huge surprise. She collected letters from many of you, and many others as well—friends the Lord has given throughout the years. They shared memories or funny stories from our past, or ways in which our lives have touched theirs, etc. It was truly overwhelming, and I wasn’t the only one to shed tears many times over. Every letter is a treasure, showing the greatness of God's love for each of us expressed through so many wonderful people God has placed in our lives. These amazing letters are a wonderful testimony and proof of what Paul says in 1 Corinthians 15:58, "Therefore, my beloved brethren, be steadfast, immovable, always abounding in the work of the Lord, knowing that your labor is not in vain in the Lord." And this same truth applies to you as well. So we want to bless you and encourage you in the coming year, that as we seek the Lord together with all our heart and with all our soul, we will joyfully discover a greater measure of God's blessing and fruitfulness not only in our own lives, but in the lives of those who God puts around us each day.